The University of Guelph is the first Canadian post-secondary institution to install a complete electronic wayfinding system called BlindSquare to help blind and visually impaired people find their way around campus, both inside and out. Installed in several high-traffic buildings in the core of the U of G campus, the system is a mobile app whose audio voicing tells users about their immediate surroundings. U of G’s initiative made headlines appearing on CBC News. The system is now operating in the MacKinnon Building and in Rozanski Hall. Hardware already installed in other high-traffic buildings will “go live” in mid-August under the first phase of the project. Under new funding announced during this week’s annual accessibility conference at U of G, Physical Resources plans to make the system available throughout campus within five years. 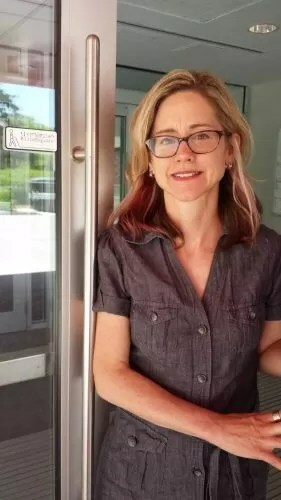 Jill Vigers, manager of architectural services with Physical Resources, says U of G’s new app meshes outdoor GPS and an indoor collection of beacons and QR codes. Several American universities have installed partial electronic wayfinding systems, she says, but not all three components. “We are proud to be leading this initiative as the first Canadian post-secondary institution with this complete system,” she says. By listening to their Apple iPhone or iPad, BlindSquare app users can navigate corridors, stairways and elevators and avoid indoor obstacles. The system relies on a network of battery-powered, wall-mounted beacons whose low-energy signals are picked up by the user’s device. 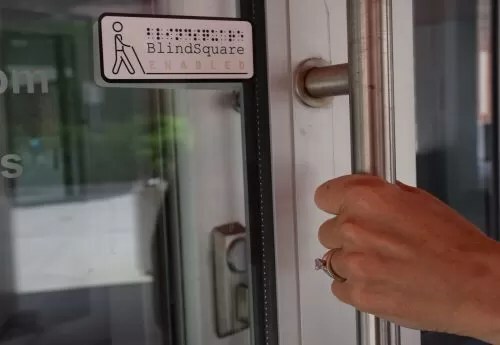 Called BlindSquare Event, the app recognizes the beacon and triggers a voice-over to orient the user inside a building and to provide directions and other information. “BlindSquare listens to the beacon and talks to the user,” says Rob Nevin, owner of U-R-Able in Guelph. His company installs and maintains the system in Canada; BlindSquare was developed by MIPsoft in Finland. About 80 beacons are now installed at main entryways and junctions in core campus buildings, including MacKinnon and Rozanski, the University Centre, the Bullring, McLaughlin Library and the Powell Building. During the next two-year phase of the project, beacons will be installed in the field house and arena, the Ontario Veterinary College, the Summerlee Science Complex and the W.F. Mitchell Athletics Centre. The new system meshes with outdoor GPS-based navigation aids to provide information both inside and outside on the U of G campus. The system begins to “talk” to users when they enter the beacon coverage zone, a 10-kilometre radius that covers the main campus, the U of G Arboretum and much of downtown Guelph. Crucially, that conversation continues not just out of doors but indoors, where GPS systems don’t work. “When you move indoors and lose sight of the sky, you lose the GPS satellite and it no longer knows where you are,” says Nevin. Touring through the MacKinnon Building with his iPhone in hand, he demonstrates how the system alerts users to locations of corridors, elevators and stairways. QR codes provide additional information about specific locations, such as telling a user that one elevator bank takes visitors to upper-floor classrooms while another bank does not. Outside in Branion Plaza, the system identifies the cannon and provides additional information about Old Jeremiah. “Students start to unlock the culture they might otherwise miss,” says Nevin. At the north end of Winegard Walk, the system describes the stairway and double doors into Creelman Hall – and even mentions the location of a whimsical tractor sculpture standing out front. He says the system frees users from relying on help from other people to find their way indoors, and also provides more information about immediate surroundings than Braille signs. That makes blind and visually impaired users more independent, says Debbie Gillespie, accessibility consultant at the Canadian National Institute for the Blind (CNIB) in Toronto. “You want to know on your own and make decisions based on your knowledge,” says Gillespie, who spoke about BlindSquare along with Nevin during the 2017 accessibility conference on campus. 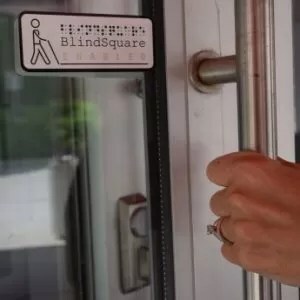 The campus BlindSquare project began after Vigers heard Gillespie discuss wayfinding systems during the 2016 accessibility conference at U of G.
Vigers was already working on a campus-wide wayfinding and signage upgrade for pedestrians and visitors. Physical Resources decided to incorporate a system for people with visual impairments into that project. About 25 students with visual impairments are registered with U of G Accessibility Services. The first phase of the BlindSquare project cost about $60,000 and will cost about $3,000 a year to maintain. Funding for the first phase came from a larger one-time campus signage budget and from Physical Resources. This week, the Guelph Lions Club announced that it will provide $48,000 for the project. “We’re committed to expanding, maintaining and keeping the system relevant,” says Vigers. Installed in several high-traffic buildings in the core of the UofG , the system is an app whose audio voicing tells users about their immediate surroundings.